Sharing some birds from our road trip, these are from Logan Ohio and Lake Logan. 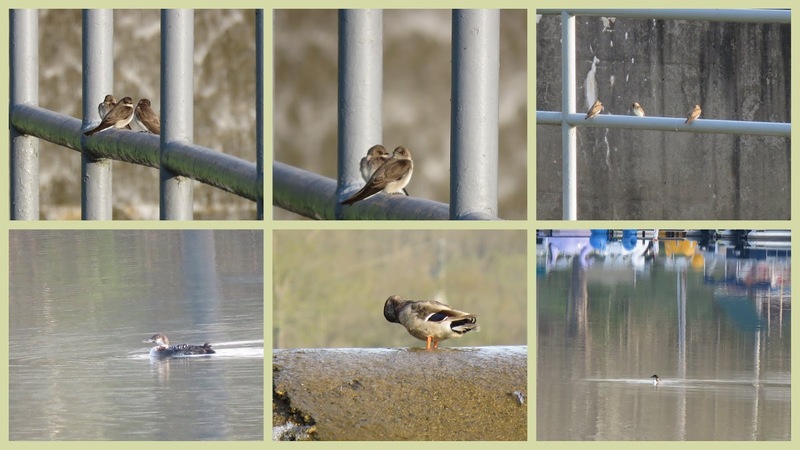 The Northern Rough-winged Swallows, Common Loon and a Mallard seen around the dam at Lake Logan. I think the Northern Rough-winged Swallows are adorable. Below are the Gray Catbird, Red-eyed Vireo, Pine Siskins, Swainson's Thrush, Pigeons, Bluebird, another Thrush, Louisiana Waterthrush, Northern Rough-winged Swallows. I hope you enjoyed the birds and photos. I appreciate and thank everyone who links up their post and for all the wonderful comments this past year ! As you can see I was able to link on and now i am off on holidays. I love the colae you have made of all the critter. Adeightful post. Thanks for hosting nd have a great weekend. What sweet birds - I have never been able to catch a swallow sitting still - great photos. Happy weekend. Beautiful photos as always! You really enjoy birdwatching. Nature always relieve our stress from life, doesn't it? This year I could see some swallows. flying around. But really SAD that they fly so fast and didn't stay even a few second. I really appreciate your sweet comments and Have a wonderful weekend. Thanks for all pics and beautiful post. My favourite is the pretty bird in the last picture! Have a happy and blessed weekend! Great bird photos, especially the Swallows! That sweet bluebird is a favorite! I can’t help but give that Bluebird a YES! All these little birds are super nice! ...I always love Bluebirds, have a great week. they are all so cute and pretty, I love the little loving couple in the middle. Thanks everyone so much for the comments! Great series of images, Eileen. I am not quite sure how long ago these pictures were taken but I was surprised that the Common Loon was still in non breeding plumage. Our northern lakes are now well populated with loons and their cry is surely one of the signature sounds of the wilderness - well, what we still call wilderness although it is hardly that anymore. Have a great weekend. 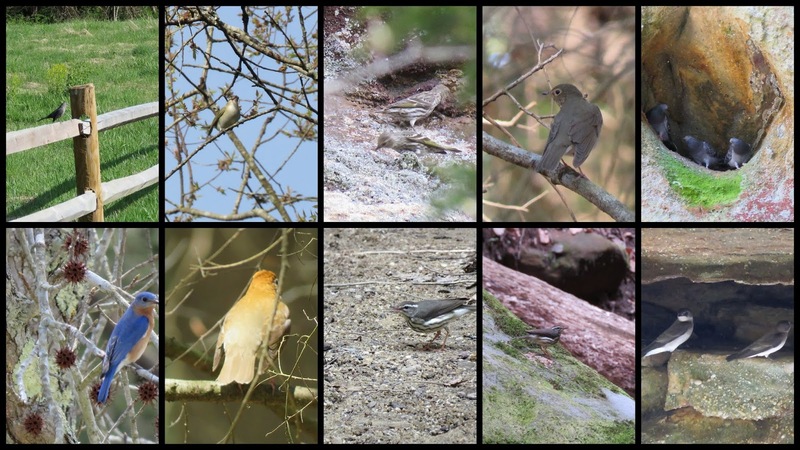 Great post and lovely collage with those beautiful birds! The Swallows are really adorable birds! Thank you for sharing!Have a lovely weekend! Nice variety! The swallows and bluebird are beautiful! Cutie Pies one and all. Lovin' the collages today, as always!!! Oh, that bluebird! such beautiful captures this week, the swallows are sweet looking. but as always, the bluebird is my favorite, that is a gorgeous picture!! i have never seen a thrush!! Wonderful shots all, Eileen, but that bluebird is by far my favourite! Your shots are just getting better and better, Eileen! Hi Eileen. What a lovely mixed bag of birds today. I do like the Rough winged Swallow. It's not one I see on blogs normally. Have a lovely weekend. Again---excellent shots. I do think those Northern Rough winged Swallows are so sweet. Such pretty birds. I'm definitely stretching my linkup this week to call it a critter! Wonderful variety of birds. Swallows are difficult to capture. They sure are busy birds. Nice shots. Love the bluebird! Have a wonderful weekend! Nice variety of bird pictures but I must say the blue bird is my favorite. Wonderful bird shots, Eileen! Loved seeing them all. You found a great spot. Eileen, like the collage. Thanks for sharing. What a variety of birds in nature! Your blog helps to realize all the greatness of nature. Three on a perch, lovely shot, and super collages. What a variety there, a great place to visit. That last shot is such a great one. Seemed to be posing for you! I love all your beautiful critters Eileen ! I love the bluebird and the swallows. Watching swallows swooping around is such a thrill! Thanks for hosting us, Eileen! Very nice ! I love the last photo ! I love the Swallows, they are fantastic. And, every in the photos Eileen. Great bird photos, as always! Happy Saturday! Happy day to you, bird watcher. Many birds are waiting for you. I've never seen a catbird in real and some others, you have such a variety there! What a series...all are beautiful! Have a nice Sunday, Eileen! Thank you for bringing your birds to us for our viewing pleasure over the weekend. Always wonderful nature shots here ~ love our feathered friends ~ so beautiful! My favorite is the last one, of the Bluebird. So lovely to see all the birds, especially the swallows. Hope your weekend has been good, my good wishes for the new week to come. Beautiful pictures.. in the morning when I walk I see all the mallard ducks.. Funny shots of all these beautiful birds. Great. The bluebird is particularly distinctive! Nothing to link, just lovely comments for all the birds, especially the blue one! I enjoyed my time in your gorgeous state but does it always rain like that? We hardly saw the sun (or anywhere else!) and I'm longing to return -- in good weather! Wow - that bluebird is stunning! Thank you for sharing the outing (and for dropping by my blog). Wishing you a healthy, happy and thankful week Eileen.